An amphibious operation involves the co-ordination of military and naval forces to effect a landing on a hostile shore. The first large-scale landing in the Second World War was by the Germans in Norway in 1940. 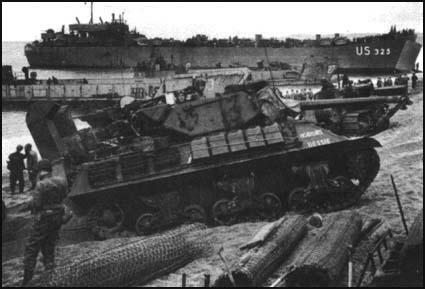 Amphibious operations by the Allies included St Nazaire (March, 1942) Dieppe (August, 1942), Normandy (June, 1944), Iwo Jima (February, 1945) and Okinawa (April, 1945). A Sherman Tank being landed at Normandy in June 1944.